The iXflash offers rapid one-touch photo and video back-up for iPhones, iPads, and iPods which have a Lightning connection. In addition, the iXflash can transfer videos and photos from these devices directly without using any device memory. With the dual Lightning and USB 3.1 connection, the iXflash can work as a portable media library (from 32GB up to 256GB), storing a whole collection of music, movies, and videos (even data files like PDF) that can be played directly through any Apple device with the Lightning connection or any computer with a USB connection. For more information, go to https://www.runtechmedia.com/t/categories/Flash-Memory-7/Mobile-Flash-Drive. 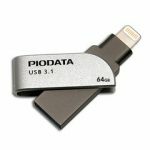 Apple user group members will receive a 20% added discount to the lowest price shown on the 32GB, 64GB, and 128GB iXflash exclusively through RunTechMedia.com. This offer is only available when you call RunTech Media and speak with a sales associate. See your user group Ambassador for contact information and discount code. This worldwide offer is valid through June 30, 2019.